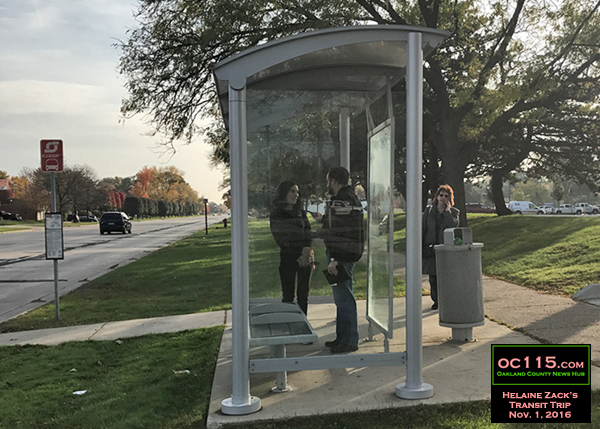 Huntington Woods, MI – With one week to go before the Nov. 8 election, County Commissioner Helaine Zack of Huntington Woods decided to take a non-driving trip herself to see what challenges people without cars face, and to contemplate what would be different if the Regional Transit Authority proposal passes. 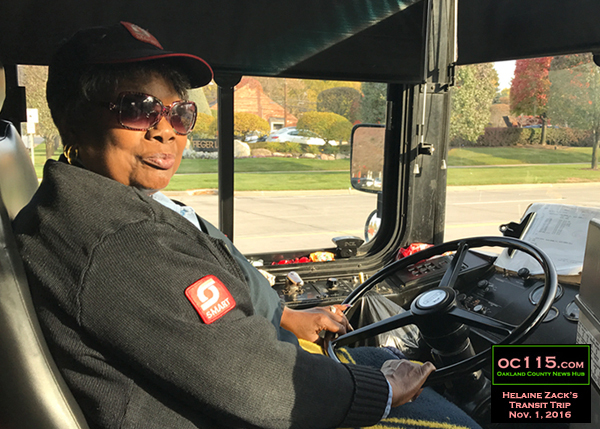 “I wanted to take what might be a typical trip for someone getting out of work and going to the hospital to see a loved one, then going back home,” she said. 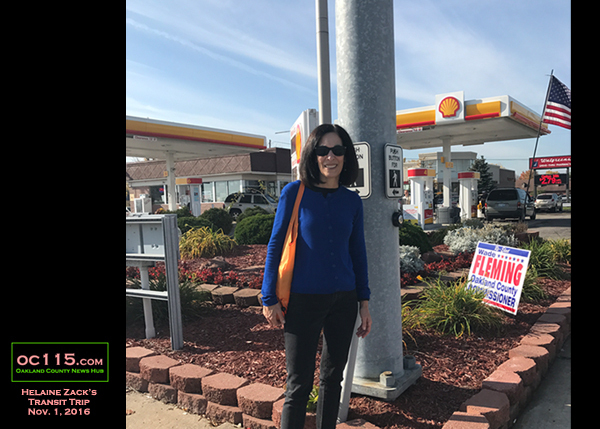 The oc115 accompanied Zack on her journey, which began at the Tim Hortons on Evergreen just north of 10 Mile in Southfield. From there the 18.8 Mile trip to the hospital would have taken 25 minutes by car. By bus it was a nearly three hour commute that included over 3.5 miles of walking. After a brief walk to 10 Mile, Zack waited for the 730 bus, which ran about ten minutes late. 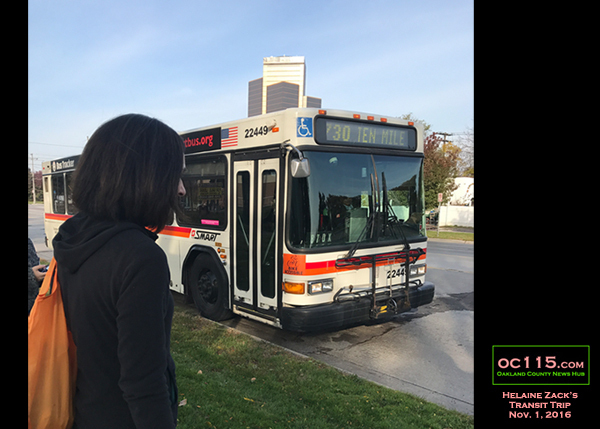 The SMART phone app did let Zack know where the bus was on the route however, and the driver was able to make up the time. 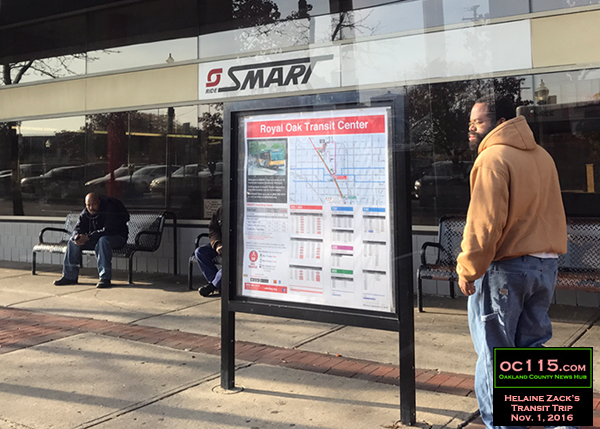 As the bus traveled east along 10 Mile, then made its way to the Royal Oak Transit Center on 11 Mile, Zack talked to various people who ride the bus regularly. Zack also met a young woman who lives in her district in Oak Park who will be voting for her first time on Nov. 8. 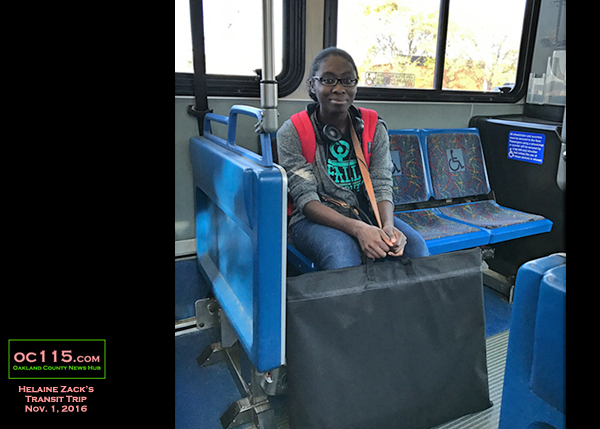 With a giant portfolio full of art projects, Tameya Brown takes the 730 to Royal Oak so she can attend classes at Oakland Community College. She said she knows other people who take the bus who can’t afford cars. Commissioner Zack and Brown talked about the upcoming election, what a County Commissioner does, and what the RTA specifically would do. “It’s going to mean more frequent pick ups and more routes so you can get different places easier,” Zack said. 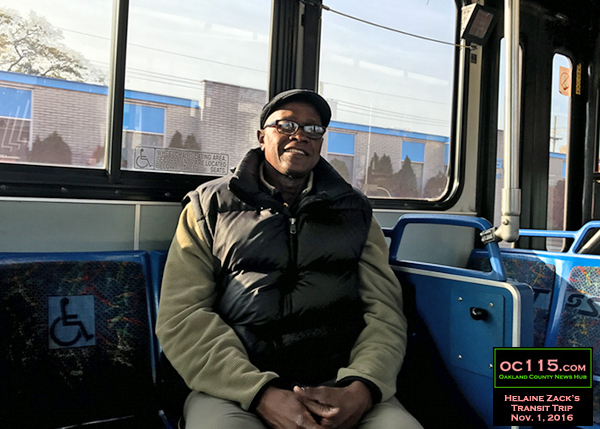 After getting off at 11 Mile and Dequindre, Zack waited about 15 minutes for the 494 Dequindre bus. 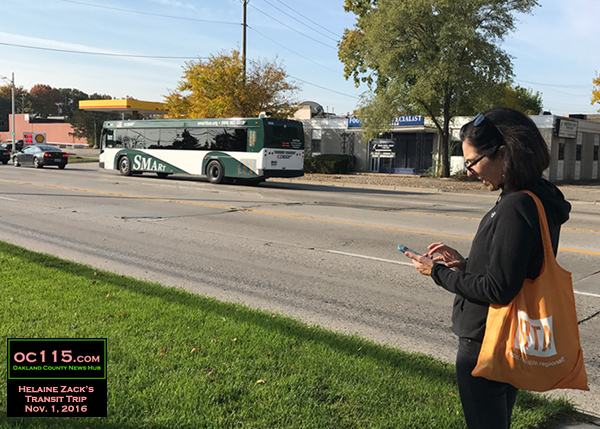 This gave her a chance to text with a reporter, and to experience the traditional bus-stop ritual of walking to the curb and looking off into the distance for the first sign of the bus, which appears on the horizon taller than the oncoming cars in front of it. Currently the 494 ends at Big Beaver Road, with the last stop being in front of Target. 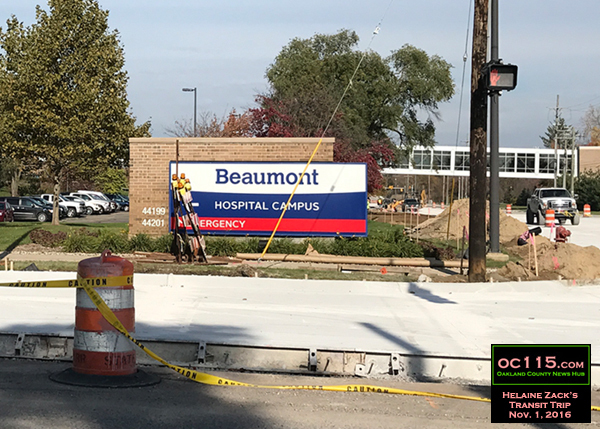 To reach the Beaumont Troy campus Zack then had to walk the remaining 3.5 miles. 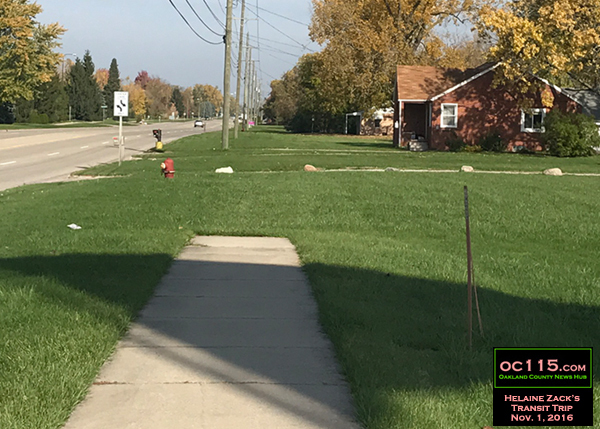 Along the way, sidewalks stopped and started without any continuity. Often walking on the shoulder or across soggy areas of grass, the journey was far from smooth. 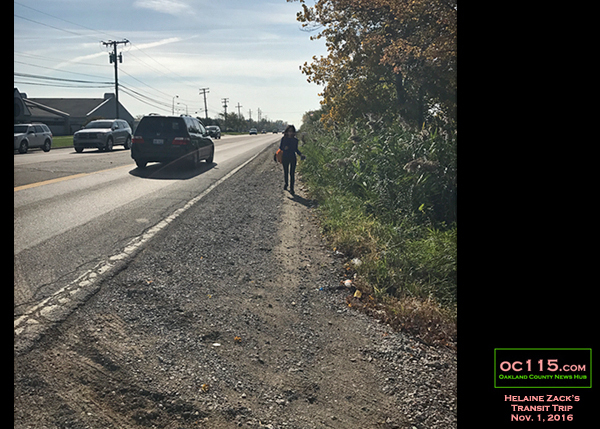 As she approached Square Lake Road a driver was so distracted by Irma’s Family Farmstand that he veered into the shoulder to turn around, forcing Zack to dart away nearly into the wild-grass-filled ditch. The driver had not even seen her. Arriving at Beaumont 2 hours and 40 minutes after the start of her trip, Zack was ready to try an often-suggested alternative. Zack waited 15 minutes for an Uber driver to be available, then paid just over $18 for a trip back home to Huntington Woods. 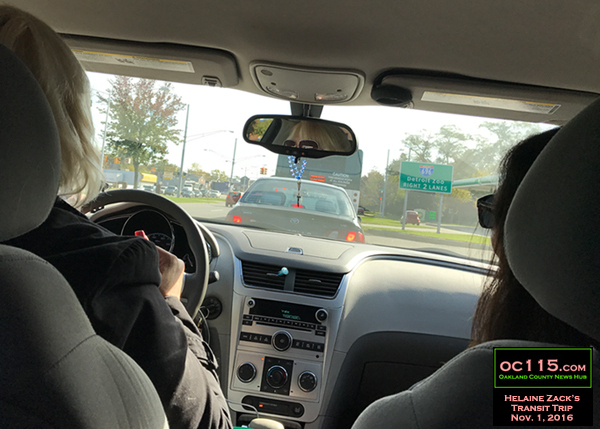 She said that one problem in the Metro Detroit area is that when students go back to school in the fall there are fewer Uber drivers on the road. “That’s why you get the long wait times,” she said. 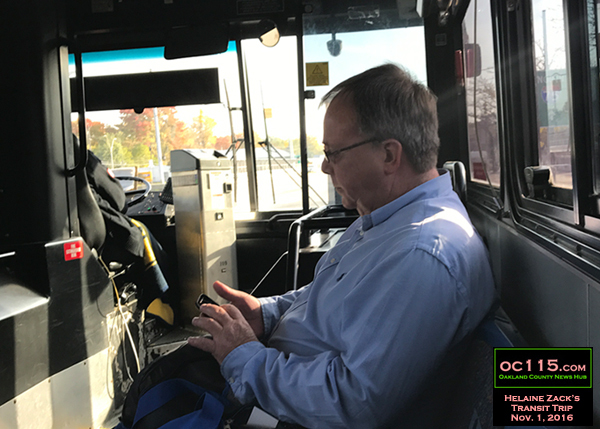 Commissioner Zack is a strong supporter of the RTA proposal, which would extend the routes, add more frequent trips, provide uniform payment methods between existing systems (such as DDOT and SMART), add service to the airport, and connect the systems across Wayne, Oakland, Macomb and Washtenaw Counties. 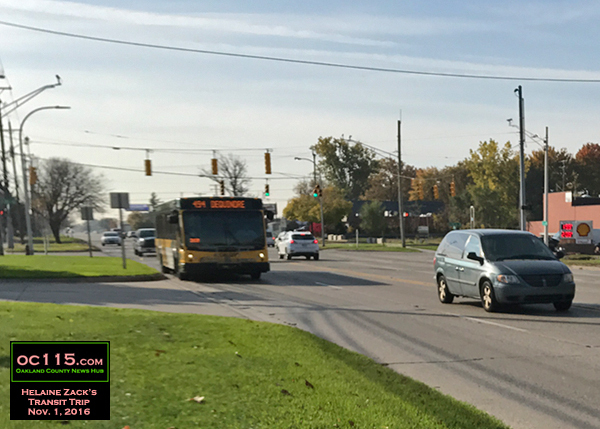 The Dequindre bus is one that will be extended if the proposal passes. It would no longer stop at Big Beaver, but would continue all the way the Rochester Hills. The trip Zack took Tuesday, and workers take each day, would be shorter by an hour. 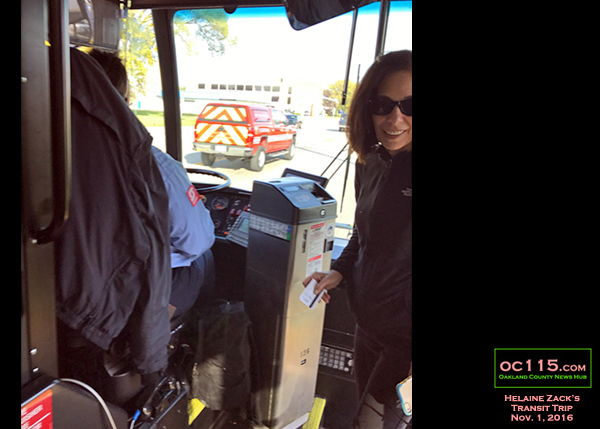 “I have traveled to other cities and transit is a part of the community. It is an enjoyable experience and easy to use. If we want Metro Detroit to thrive as a region we need to invest in making it better,” Zack said. The RTA would be a 20 year levy of 1.2 mils for residents in all four counties. For more information visit http://www.rtamichigan.org/.